In telling this tale, I will try not to be convoluted or confusing. Okay. 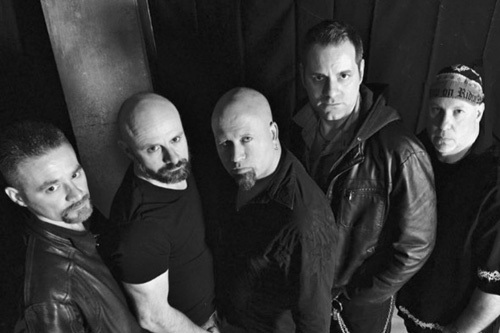 Wicked Maraya, an American metal band with roots in Long Island, recorded a nine song demo with legendary producer Jim Morris (Savatage, Iced Earth, et al) at his Morrisound Recording Studio. That recording was Lifetime In Hell. Through various complications and reasons the demo got shelved. However the band did release three albums between 1994 and 1997, the latter two under the name Maraya, all receiving some acclaim. Twenty years forward, Wicked Maraya resurfaced with it's five original members, revolving around founding members and brothers John and Michael Iadevaio, with Falco, cousin Dan Malsch, and Mike Nack. Five years more, the band finally releases, after 25 years, the album which had been gathering mothballs, Lifetime In Hell, with two new songs, through Massacre Records. Suffice to say, Lifetime In Hell finds the band in its first nascent form. Largely, Wicked Maraya plays American twin guitar heavy power metal reminiscent of Iced Earth and Crimson Glory. They have a sharp and heavy sound thanks to the brisk, near thrash-like, riffage and the thumping bottom end of the rhythm section. This same intensity fuels the twin guitar harmony and solos, the latter quite abundant. Falco has a classic metal voice, singing clean, yet still a little raw and sharp, like the music, without going screamo on you. However, listening to the earlier songs and then the two new ones, Falco's voice has gotten slightly deeper with age. But that's just my ears. One thing that hasn't changed with the new songs is the Wicked Maraya sound. Both Suicidal Dawn and Fall From Grace could have been done in the same recording session. With this description and these elements in mind, the songs of Lifetime In Hell are rather straight forward heavy power metal, consistent in approach and presentation. But I found a few that stood out for me. One is Tomorrow's Child, probably the most AOR sounding melodic metal song, where the twin guitar riffs sound like they been lifted from the first Boston album. Another is the song Johnny. It has this mix of tempos in the first half, thumping then brisk. Falco's vocals have this subdued presence that linger under the music rather than above. Then the songs wraps up with a significant symphonic outro. Finally, the title track invites some notice thanks to the mixture of speed with some razor sharp riffs. Falco's voice matches the same, being more aggressive. But what will catch your ears is the quiet guitar breakdown just after the midpoint. 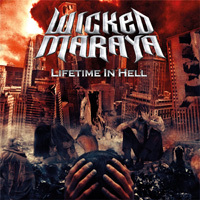 With Lifetime In Hell, Wicked Maraya celebrates both its inception and its future with classic American heavy/power metal style, something still favored today, at least in the European theater. What goes around, comes around. Welcome back. Recommended.